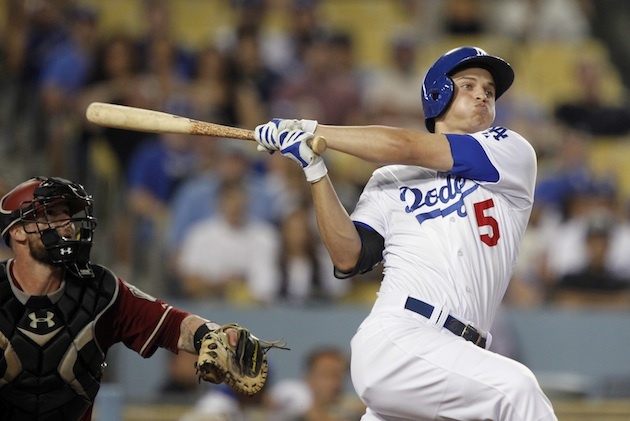 The L.A. Dodgers always knew Corey Seager was their shortstop of the future. What they didn't know was how an aging former MVP would help make the ascension as smooth—and peaceful—as possible. I’m not gonna get down, I’m not gonna get defeated. I’m not gonna get depressed and ‘oh, woe is me.’ I have a job to do. The quote was delivered with the bluntness of an aging warrior at peace with his fate. His turn in the limelight was coming to an end. It was time to pass the baton, and while he perhaps wasn’t entirely O.K. with it, he at least understood. They’re going to play him. The message came from Jimmy Rollins, the 17-year veteran, a former MVP and World Series Champion now committed to career twilight with the Los Angeles Dodgers. The “him” in question: Corey Seager, a lanky 21-year-old shortstop with a smooth left-handed stroke reminiscent of John Olerud. Much to the delight of a fan base grown antsy after a 27-year championship drought, the Dodgers had decided the kid would get the bulk of the playing time the rest of the way — including in the playoffs. Perhaps encouraged by a bit of prodding from above, Dodgers manager Don Mattingly has since reaffirmed on the switch, batting Seager third in Game 1 against of the NL Division Series against the New York Mets, and second in Game 2. So far, the returns have been more or less a push. Seager—foiled like the rest of his teammates were by the red hot Jacob deGrom — was 1-for-4 with two strikeouts in a 3–1 loss in Game 1. His lone hit was a harmless fly ball Seager thought was tailing foul, until the Mets’ Michael Cuddyer badly misplayed it into a double. In the field, Seager saw only one opportunity come his way — a routine Juan Lagares grounder in the ninth. He butchered the throw, but was bailed out when first baseman Adrian Gonzalez deftly handled the in-between hop. He looked more relaxed in the Dodgers’ 5–2 Game 2 victory, however. He went 0-for-4 at the plate, but handled each of his fielding attempts flawlessly, including a nice over-the-shoulder basket catch in the second inning to rob Lucas Duda of a momentum-sparking hit. As for Rollins, he went 0-for-1 in a pinch-hit appearance in Game 1 and didn’t leave the bench in Game 2. Still, regardless of the postseason impacts Seager and Rollins might have, the switch was about much more than what happens this October. It was about developing talent and playing for the future — necessary considerations even for one of the richest teams in all of baseball. Truth be told, many also view the move as a matter of necessity, a recognition of an end to a failed experiment. When you look at the numbers, it’s not hard to see why: Rollins is coming off a season in which he registered career lows in just about every major statistic, including batting average (.224), on-base percentage (.285) and OPS (.643). All of which can be trumped, in the hearts and minds of the Dodger faithful, by a simple nod: Rollins has done everything that’s been asked of him. Given L.A.’s reputation as a paragon of analytics, this might seem like an odd sentiment to have. After all, how could guys like Andrew Friedman, whom the Dodgers poached from Tampa Bay, and Farhan Zaidi, who studied under Billy Beane, be content with the .224/.285/.358 slashline that Rollins presented? While they certainly weren’t thrilled with Rollins’ plate prowess, Friedman and Zaidi were looking at things with a much more nuanced eye than you might expect. The most obvious observation is that Rollins — a career .265 hitter — was brought in mostly for his defense. And while the 36-year-old was never going to be the Gold Glover of seasons past, he certainly struck a better facsimile pose than his predecessor, the disinterested potted plant known as Hanley Ramirez. Simply put, Rollins got to nearly all the balls he was supposed to get to, and made nearly all the plays he was supposed to make—while pulling an occasional rabbit out of the hat, like this gem. The second reason Rollins was brought aboard was for his leadership — another marked improvement over Ramirez. You could see it as early as spring training, when the longtime Phillie sought out budding superstar Yasiel Puig for what turned into a two-hour conversation. This was no veteran fire-and-brimstone lashing, but rather a genuine attempt to get to know a young lightning rod capable of dazzling and frustrating in near-equal measure. Third, Rollins was asked — tacitly, perhaps, but with writing on the wall all the while — to hold a spot for Seager until he was ready, and to step aside gracefully once he was. During a session with reporters in August, just as he was finally beginning to emerge from a horrible, three-month hitting slump, Rollins spoke about his ability to keep a level head, to find ways to contribute despite his struggles at the plate. The hitting never quite caught up, but that kind of team-first attitude quickly drew the respect of Dodgers management — a respect that has since been returned in kind. At one point during the season’s dog days, just as Seager was beginning to tear up Triple-A, a team official defended to me the team’s decision to stick with Rollins and wait until rosters expanded in September to promote Seager. If you call up Seager now, he reasoned, you have to sit Rollins, and the veteran is too valuable to risk having him check out on the team early in the season. It was a fair point at the time. Since then, the plan has gone almost perfectly. Following his September call up, Seager quickly saw an increase in playing time (thanks in no small part to a Rollins injury) and began raking the ball. Meanwhile, the Dodgers breezed to a third straight NL West crown down the stretch, clinching home-field advantage in the NLDS in the process. The veteran knew the score. He saw his role about to change, and he faced it like any good professional would. He said all the right things: that he was fine with the team’s decision; that the name on the front of the jersey mattered far more than the one on the back. Coming from most, the statements could’ve easily sounded cliché. But it’s in the consistency of Rollins’ statements — the same sense of grace and leadership from Day 1 on — that Dodgers fans have found reason to believe their new shortstop's ascension will continue to be smooth. The Dodgers brought Rollins to LA for three simple reasons: to play defense, to lead the clubhouse, and to step out of the spotlight once their franchise phenom was ready. In the end, Rollins gave the Dodgers everything they asked for. But it’s the above and beyond — how much more his words and manner have meant — that could end up paying the biggest dividends of all.